This book is currently unavailable as the publisher has folded. Look for the series to relaunch in 2020! 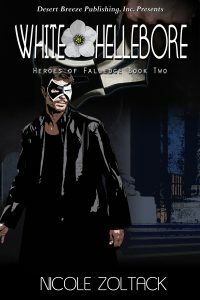 Kiya the witch isn’t the only new foe in town as the drug that created Skull Krusher has now transformed a scientist into yet another monster, forcing Nicholas to don his Black Hellebore mask again and save Falledge. Nicholas has no help this time as Kiya gains possession of his love Julianna’s body and brings the soul of Justina, Nicholas’s high school sweetheart and Julianna’s twin, with her. Despite himself, Nicholas is torn between the sisters. If he can’t stop the fiends from taking over the world and destroying humankind, he’d never be able to find lasting, true love.